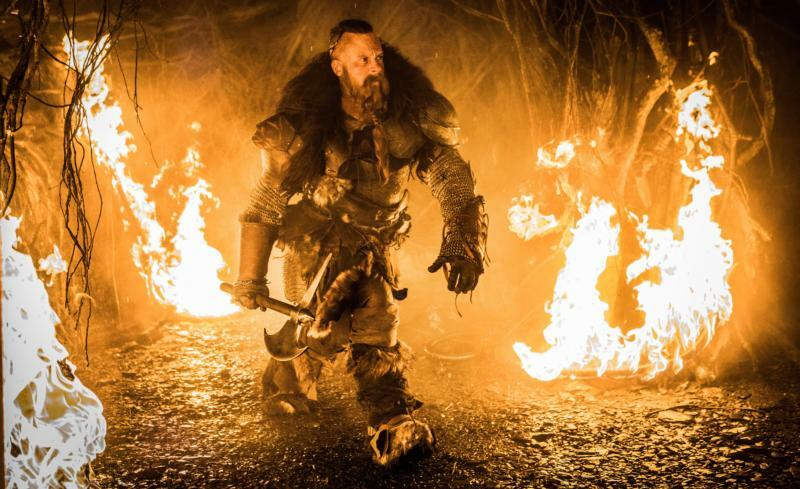 NEW YORK (CNS) — Trick-or-treaters beware: “The Last Witch Hunter” (Summit) is on the prowl, ferreting out ghouls and goblins, with a noble priest as an unexpected ally. This silly film, directed with intense seriousness by Breck Eisner (“The Crazies”), recycles such well-worn motifs as an immortal yet lonely savior figure, a secret religious society and a demonic scheme to destroy the world. Think “Game of Thrones” crossed with “Superman” and “The Da Vinci Code,” and you won’t be far off. Valiant if scruffy warrior Kaulder (Vin Diesel) has lost both his wife and daughter to the black-magic malady. Consumed with the desire for vengeance, he slays the all-powerful Witch Queen (Julie Engelbrecht), destroying her minions in the process. Before she dies, however, the queen curses Kaulder with the gift of eternal life — and never-ending solitude. Flash forward to modern-day Manhattan, and Kaulder — dashing and dapper in designer suits — works in the shadows, keeping an eye out for rogue spell-casters. He’s been assisted, for the past eight centuries, by a succession of priest-confessors called the Dolans — no relation, one trusts, to the cardinal-archbishop of New York. These presumably Catholic clerics belong to a secret society called the Axe and Cross, dedicated to maintaining the uneasy peace between humans and witches. The so-called “36th Dolan” (Michael Caine) has long played the loyal Alfred to Kaulder’s Batman. He has recently announced his retirement, however, and named his successor, Dolan No. 37 (Elijah Wood). In the manner of all such best-laid plans, this one goes awry when 36 dies unexpectedly from a nasty insect bite. Since this is a trademark means of attack among enchantresses, Kaulder suspects foul play — and a resurrection of the wicked queen. To find her, Kaulder enlists the help of benign witch Chloe (Rose Leslie), who tends bar at an occult watering hole. In addition to mixing a mean cocktail, Chloe is also a gifted “dreamwalker,” able to send Kaulder into a trance to uncover past memories. In the end, “The Last Witch Hunter” teeters on the brink of ridiculousness. Fortunately, good maintains the edge over evil; not so luckily, this suggests a sequel may be on its way. The film contains fantasy violence, scary images and some crude language. The Catholic News Service classification is A-III — adults. The Motion Picture Association of America rating is PG-13 — parents strongly cautioned. Some material may be inappropriate for children under 13.